Sarasota Certified Marketing Consultant – Over the last 19 years, Chris Bernard has handled online and offline marketing campaigns for some of the best known brands on the planet including: HSN (various brands), GM, Caterpillar, ditech.com, GM Goodwrench, Whirlpool, KitchenAid, Sears, DeVry University, Keller Graduate School, Budget Rent-A-Car, US Cellular, Motorola, Cintas, USBank, Ryder Truck Rental, Edward Jones, Sherwin Williams, Michelin, and Midas. 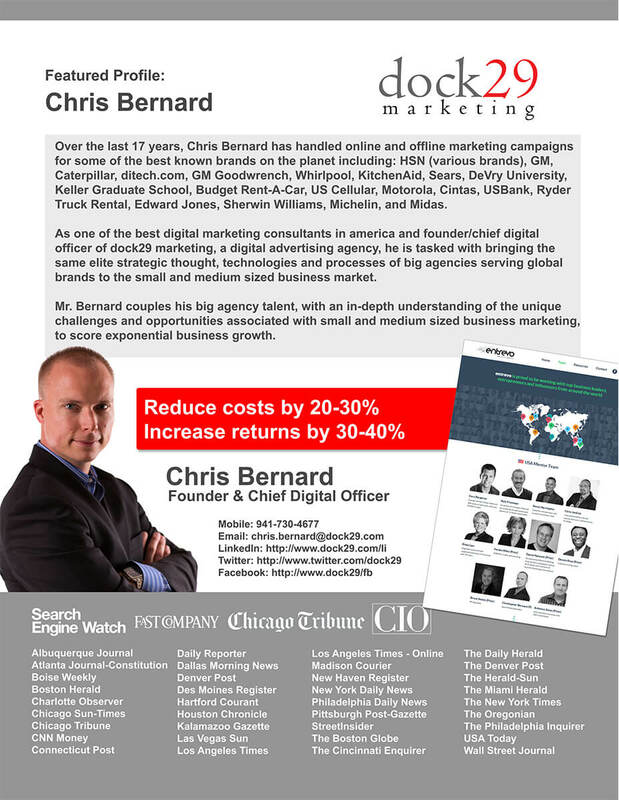 As one of the best certified marketing consultants in america and lead consultant of dock29 marketing consulting, he is tasked with bringing the same elite strategic thought, technologies and processes of big agencies serving global brands to the small and medium sized business market. I grew up in big agencies working under some of the most talented marketers in the world for Starcom MediaVest and Publicis with clients like Midas, Caterpillar, Sherwin Williams, Michelin, USBank, General Motors, ditech etc. A little more than a few years ago, I discovered that small and medium sized businesses could use the same tracking, tools and talent that the global companies leverage, but had one massive advantage…agility and efficient & decisive decision making process. Larger brands…don’t feel left out…I will work with you, but understand I will call out overly bureaucratic processes that add no value, or any roadblocks that hamper solid and efficient decision making which impact performance. This is my promise to you. If that interests you please reach out! Ummmm…. $40k is our average January, $51k is our best January, and we did $61k. Is your head swelling? Great customer service and quality of work. Also- price point is fair. Activity to our web site, including requests for quotes, has increased greatly in the past few months while working with dock29 on an SEO project. The patience, experience, and guidance provided by dock29 has been superb. It is great to work with a team of dedicated professional that are proud of their work and products. You have always “made it happen.” Thank you for your superior service you have provided. It’s as easy as 1,2,3, and 4. We want to earn your business by establishing trust and value. As a result we have created a simple, low-cost onboarding process to ensure you are satisfied every step of the way. No huge setup cost or expensive onboarding required.